This gallery of delicious breakfast favorites includes special and elegant breakfasts, easy breakfast and brunch recipes, all-in-one breakfast casseroles, pancakes and waffles, muffins and sweet breads and rolls, breakfasts the kids will love, and more. Cornbread takes the place of bread in these easy single-serve casseroles, and they bake to perfection in just 15 minutes. Follow the simple 6-step assembly and enjoy a fabulous bacon and egg breakfast! This coffee cake is the perfect cake for a coffee with friends and neighbors or makes it for a holiday morning with family. The spiced brown sugar mixture is the perfect topping for the moist vanilla cake. This fluffy blueberry oven pancake is easy to mix and bake. The blueberries add color and flavor, and it's so much easier than making pancakes in batches. These cornmeal pancakes offer fabulous flavor and texture. Serve them with butter and maple syrup or use another syrup or fruity sauce. Try this apple cider syrup or fresh blueberry sauce. Continue to 5 of 39 below. A side of home fried potatoes will turn an everyday breakfast into a special meal os skillet home fries. Add eggs and bacon, sausage, or sliced ham for a hearty breakfast or brunch. These single-serve breakfast ramekins are a snap to fix and bake. Just break eggs into buttered ramekins, add cream, seasonings, and cheese. Pop it into the oven and enjoy! Dutch babies are oven pancakes made with eggs, milk, and a small amount of flour. The single-serve dutch baby pancake puffs up beautifully in the oven, and it's fabulous with a simple topping of powdered sugar. Or top the pancakes with berries or preserves. Light handling of the dough makes these southern-style buttermilk biscuits light, flaky, and absolutely delicious. Make sure you butter the biscuits while they're hot! Continue to 9 of 39 below. This country garden omelet is one of our favorite breakfast omelets, and it's very versatile. With a little practice, you'll find omelets are easy to prepare and very adaptable. Use your favorite breakfast meat and diced vegetables, and try your omelets with different kinds of cheese, seasonings, or herbs. These kid-friendly chocolate chip pancakes are filled with chocolate chips. Try the banana variation or add some chopped pecans. This simple breakfast casserole is made with eggs, bread, and cheese. It's a fluffy, souffle-like breakfast bake. Deep-fried fritters are delicious little doughnuts, and these apple fritters are especially nice on fall mornings. Roll them in cinnamon sugar or powdered sugar, or serve them with syrup. Continue to 13 of 39 below. This homemade perfectly spiced sausage mixture starts with lean ground pork, or grind your own pork with a meat grinder or food processor. A quiche always seems extra special, and it's really quite easy to prepare and bake. Use ready-made pie crust or a frozen deep dish crust if you don't have time to make homemade pastry. Diced ham and broccoli team up in this easy quiche, along with sliced mushrooms and sliced tomatoes. Delicious and elegant eggs Benedict take a bit of time, but they make a great weekend or holiday breakfast or brunch dish. The unexpected combination of apple and bacon in these muffins gives them incredible flavor. Add some chopped pecans for extra crunch. Continue to 17 of 39 below. 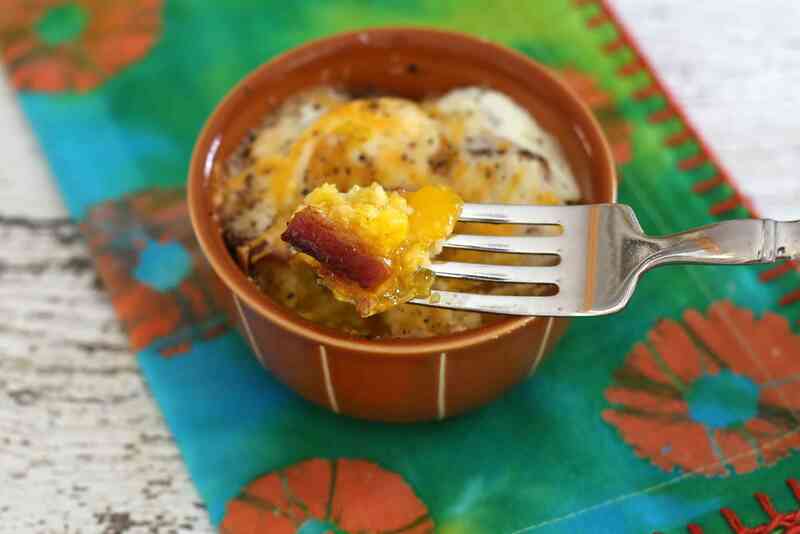 Cheesy bacon grits provide the base for this easy breakfast egg bake. Make it in individual ramekins for single servings. Lemony biscuit-like scones make a delicious breakfast or snack. Make them for visiting friends and family! A breakfast casserole is always easy and convenient. Most can be made in advance and refrigerated overnight. Just let it stand at room temperature for about 20 to 30 minutes before baking. These sausage pinwheels can be served as an appetizer or as a breakfast bread. They're great with eggs. They're easy to make with puff pastry and breakfast sausage. Continue to 21 of 39 below. This hot breakfast bulgur cereal is a tasty change from the everyday oatmeal or cream of wheat, and it's very easy to make. Scrambled eggs are easy enough to make every day, and they always satisfy. Scrambled eggs are always welcome, and they are easy enough to make even when you're short on time. These scrambled eggs are made with chopped tomatoes and green onions, but feel free to add your own favorite herbs and seasonings. A little cheese can also be folded in just before the eggs are done. This French toast is a basic recipe, but there are many variations. Feel free to add a bit of sugar and vanilla, or spice the egg batter up with a little cinnamon. It's an excellent breakfast with syrup and ham, sausages, or bacon if you like. This ham and egg breakfast casserole is ridiculously easy, and it's versatile as well. Use bread, biscuits, croissants, or English muffins in the casserole along with your choice of cheese. Continue to 25 of 39 below. Peppery sausage gravy makes a delicious topping for hot buttered biscuits. Sausage gravy has long been a favorite in the South, and it's delicious over split buttered biscuits or hot cooked grits. Here are some typical southern gravy recipes, along with a few other related breakfast favorites. These chocolate chip muffins are delicious, and they will surely appeal to the kids! Mini chocolate chips make them a family treat, perfect for a quick breakfast or snack. This all-in-one breakfast bake is made with whole eggs, thick smoky bacon, and shredded cheese. It's easy to prepare and bakes quickly for a fabulous breakfast or brunch. Serve this dish with sliced fresh fruit or berries, or make a warm spiced fruit compote to go with it. Grits are a staple here in the South, and they are versatile enough to use as a rice replacement in many dishes. Sweeten the breakfast grits with syrup, preserves, or chopped nuts, or serve as a savory dish with eggs, cheese, and butter. Continue to 29 of 39 below. The dough cycle of your bread machine makes these cinnamon rolls easy to mix. Add some finely chopped nuts to the cinnamon filling for extra texture. This amazing blueberry sour cream crumb cake is perfect for a special brunch or morning coffee get-together. It's also a great way to use fresh blueberries! This breakfast casserole is very seasonal because of the spring ramps, but green onions (scallions) may be substituted for the ramps. The casserole may be prepared the night before, so it's a good choice for holiday or weekend breakfasts. This French toast is made with a surprise ingredient, pumpkin! The moist and delicious French toast is topped with an amazing spiced apple cider syrup. Continue to 33 of 39 below. Pain perdu means "lost bread," as New Orleans style French toast is traditionally made with day-old French bread baguette slices. Baking the egg-battered slices makes it an excellent choice for a busy morning. These wrapped French toast sausages will surely be a hit with the whole family, and it's especially kid-friendly. Serve them with fruit and maple syrup. These fluffy basic pancakes are perfect for a weekend morning or holiday breakfast, along with sausages or bacon and your favorite syrup. A crustless quiche is super easy to prepare, and it's high in protein. This version is made with fresh spinach and cheese. Continue to 37 of 39 below. An easy lemon syrup and lemon zest flavor these fabulous lemon muffins. Serve them with breakfast or brunch. A streusel topping makes this peach cake perfect for a special brunch. Or serve it with a scoop of ice cream or whipped topping for a delightful summer dessert. The cake is made with fresh chopped peaches, but frozen or canned (well-drained) should work just fine. This easy egg bake can be made with breakfast link sausages, smoked sausage, or spicy andouille sausage.